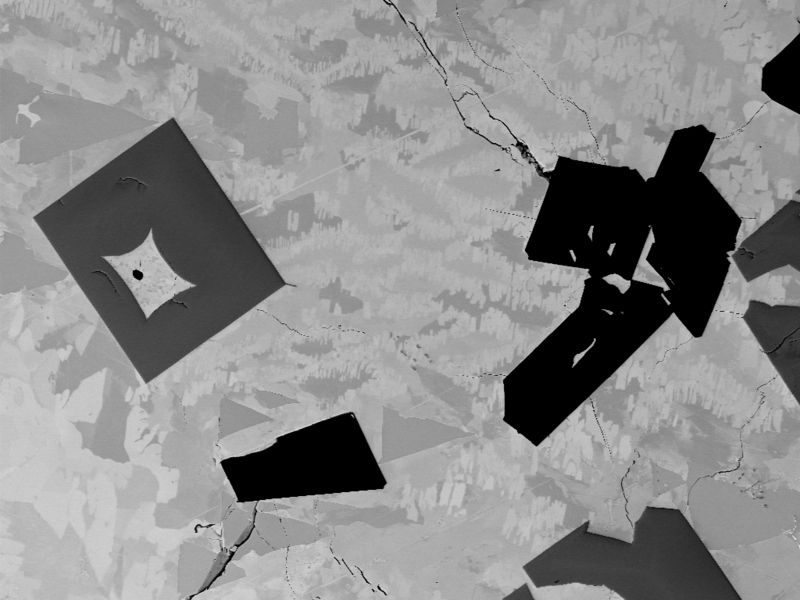 SEM and TEM analyses of minerals xifengite, gupeiite, Fe2Si (hapkeite? ), titanium carbide (TiC) and cubic moissanite (SiC) from the subsoil in the Alpine Foreland: Are they cosmochemical? Authors: M. Hiltl 1, F. Bauer 2, K. Ernstson 3, W. Mayer 4, A. Neumair 4, and M.A. Rappenglück 4 – 1 Carl Zeiss Nano Technology Systems GmbH, Oberkochen, Germany (mhiltl@online.de), 2 Oxford Instruments GmbH NanoScience, Wiesbaden, Germany (frank.bauer@oxinst.com), 3 University of Würzburg,Germany (kernstson@ernstson.de), 4 Institute for Interdisciplinary Studies, Gilching, Germany (info@mayer-chiemgau.de, agneumair@arcor.de, mr@infis.org). The abstract may be downloaded HERE. Fig. 1. 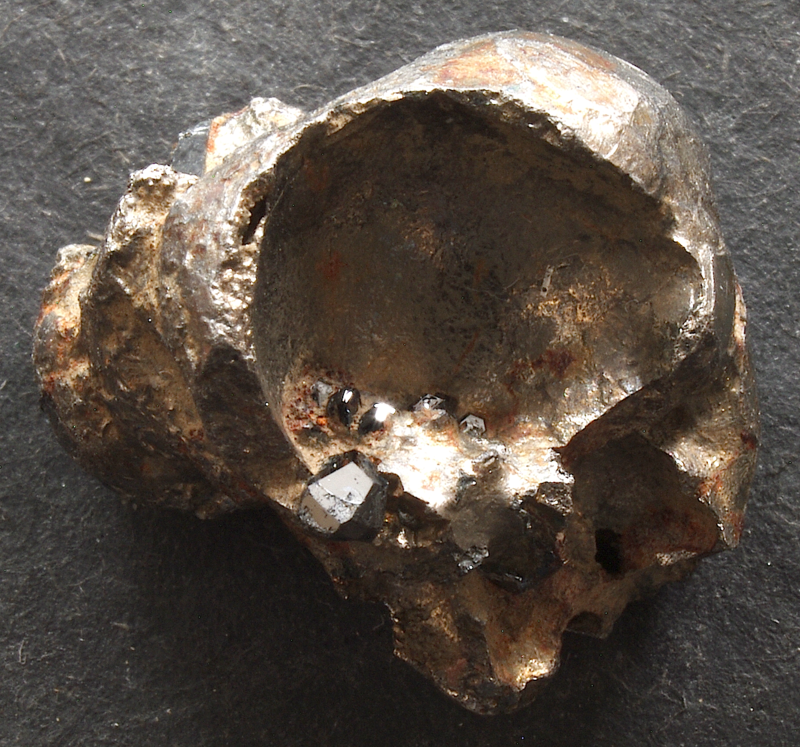 Iron silicide particle (maximum size 18 mm) with cubic moissanite crystals (details see Fig. 2) sticking out from the matrix that is mostly composed of xifengite, Fe5Si3, and gupeiite, Fe3Si. An iron silicide, stoichiometrically Fe2Si, has also been analyzed, which may represent the rare mineral hapkeite. Hapkeite has so far been found on Earth only in the Dhofar 280 meteorite assumed to originate from the Moon. Fig. 2. 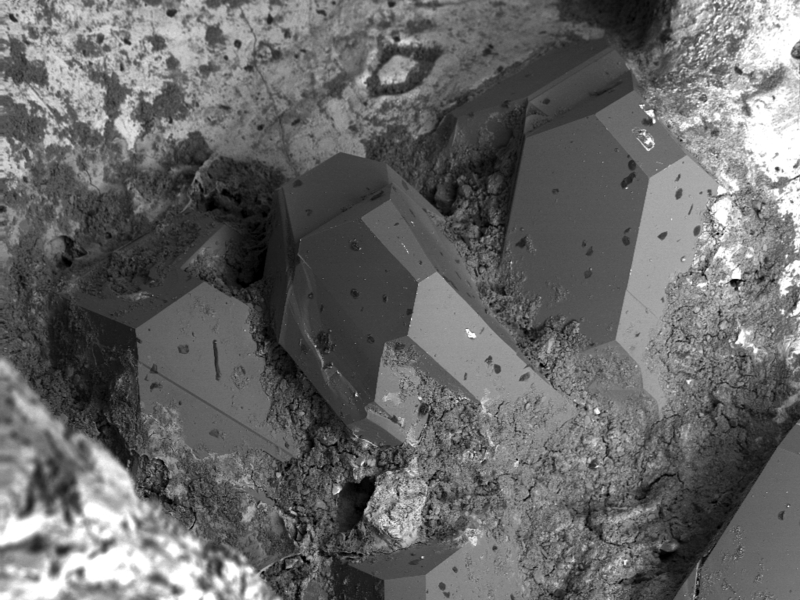 SEM image of moissanite crystals from the iron silicide specimen shown in Fig. 1. Source Carl Zeiss Nano Technology Systems GmbH. Fig. 3. Titanium carbide (TiC, dark gray), and silicon carbide (moissanite, SiC, black) crystals in a matrix of intergrowth of various iron silicides. Iron silicide particle from the Chiemgau impact meteorite crater strewn field. EBSD image; the field is c. 500 µm wide. The authors suggest that the minerals formed by chemical vapour deposition from the ejecta plume in the impact event and hence may be used as a reliable diagnostic tool for hypervelocity impact on Earth. In the case of the Chiemgau impact, the extreme purity of the moissanite and TiC crystals and their association with the xifengite and gupeiite iron silicides are rather speaking in favor of a primary cosmic origin however.